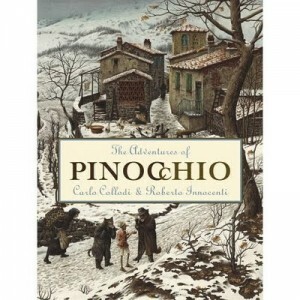 Pinocchio by Carlo Collodi (1882) is a rare thing: an archetypal story for children. The puppet-boy represents every disobedient, lazy child who must face life’s hardships, find parental love and grow up. It can also be read as a Christian allegory, a snapshot of society or as a myth. The language of this classic has barely dated. The best recent version is illustrated by Roberto Innocenti, capturing all the pathos of the tale – his iconic artwork combines painterly detail with cinematic angles. This dark, humourous adventure is a far cry from the sanitized (but beautiful!) Disney movie version. This entry was posted on Friday, December 16th, 2016 at 9:09 am	and is filed under Book Reviews, Children's Books. You can follow any responses to this entry through the RSS 2.0 feed. You can skip to the end and leave a response. Pinging is currently not allowed.